Today is World Wide Knit in Public Day. The largest knitter-run event in the world, WWKIP was started by Danielle Landes in 2005 to get knitters out of their house and to knit together in public. Today there are more than 48 countries and over 320 knit-in-public events happening around the world. Click here for places that are hosting WWKIP events around Australia today. Knitting and crocheting in public is a great way to socialise, share skills and ideas, and to demystify the handcrafts. I sometimes save bits of knitting for an upcoming commute or road-trip, or an imposed wait for this or the other. Miles of stocking stitch or a simple, repetitive pattern somehow melt away when you’re looking out a window at passing scenery, waiting at the doctor’s or for your child do laps up and down a pool. The easier the pattern, the chances of something going wrong is minimised – and if something does go wrong, it’s not too hard to fix. Circular needles are useful when knitting in public since they take less room and you don’t have to worry about dropping a needle. It’s also a good idea to have your project in its own bag in your regular bag, so everything is contained. Read the pattern ahead so you know what other notions you may need. On the face of it, what can possibly be wrong about knitting or crocheting in public, but the world can be a strange place, so be prepared for comments from those who are perhaps less familiar with knitting and crocheting: the good, the weird, and sometimes even ignorant or rude. As a wise ad man once said, assume good intent. 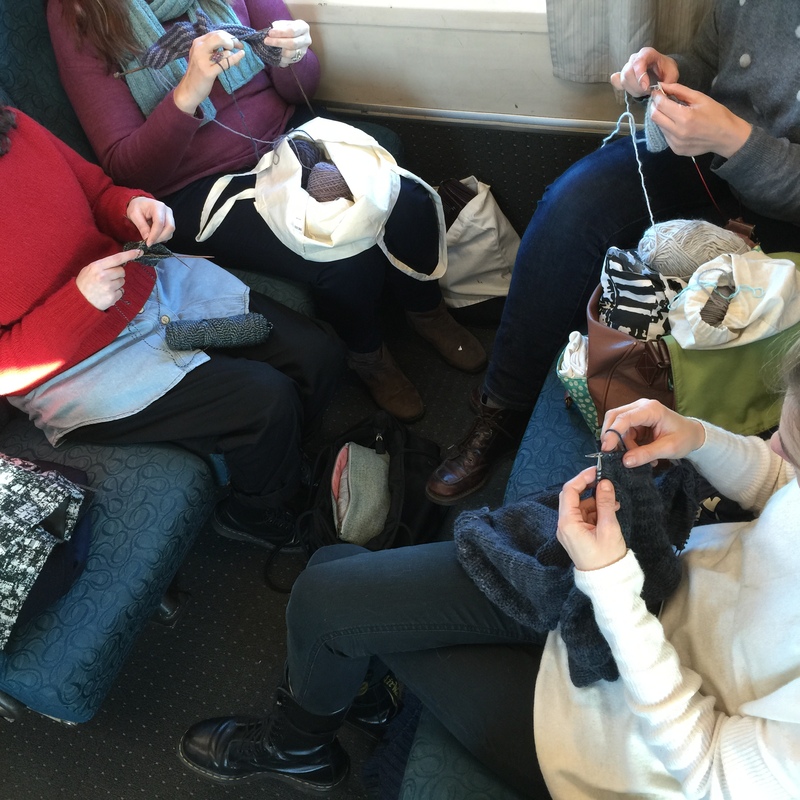 Knitting or crocheting in public is a great ice-breaker, and many a friendship and wonderful conversations have started over the simple act of making. People who make get other people who make. If you’re in the Melbourne CBD, Knit One Give One are meeting in the dining hall in Melbourne Central, and making scarves and beanies to be donated to needy organisations. They are happy to teach you how to crochet and knit if you don’t know how, so just bring your yarn, needles and hook and join in. So … what will you make today? Categories: Uncategorized, wwkip | Tags: knitting Melbourne, Sunspun | Permalink.